The technology is out there, experts say. And the skepticism over drone delivery is pretty similar to the negative responses towards the very first motor cars. But the fact is that drones require neither drivers, nor free traffic lines. Besides, drones are much more time- energy- and cost-efficient in contrast to the car delivery. The company inventors believe drones can be of great help in case of natural disasters, when the safe drugs delivery to the hazardous areas is crucial. Let’s take a closer look at how the drone delivery works and what kind of not-too-distant future is looming for the invention. The process starts with the departure point. Let’s say there is a doctor, who needs to send a blood sample to the laboratory that is located somewhere across the city. Previously packed up, the samples would be taken to the landing pad, usually on the hospital roof. Just a small rooftop or yard will be enough to take off. The drones can hold almost 1 kg and transport items over 10 miles. The current drone technology development level enables the devices to travel up to 40 mph. In general, the drones require 8 minutes to make a 10-mile journey. In order to increase the flight time, one should replace the battery after every delivery. 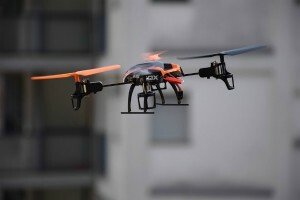 Once the drone is attached with the package that should be delivered, the device is powered up and connected to the network of the delivery company. The senders are free to choose from the list of available destinations that are within the drone reach. In case of theft, the nits can be easily shut down remotely. Moreover, there’s a parachute that will deploy immediately if the drone fails. When you’re settled with the destination point, device generates the route in an automatic mode. It is based on the airspace (the drones do not fly near the restricted airplane areas), terrain (account for buildings, hills and tress), density of population (the drone won’t fly over the public areas) and weather conditions (the flying units don’t take off in case the weather conditions are adverse). To make the drone set off, you just tap onto the send button and you’re set. In contrast to the remote-controlled drones available on Amazon, the delivery machines usually take off and fly without remote control. At the end of the journey the drone will automatically put its propellers on lockdown so that the user can retrieve the contents, as well as attach a new package without caution. The inventor team believes that the value of the drone delivery is the highest in the fields where the speed is crucial. It is for this reason they will focus on delivering vital cargo and not the common good. Federal Aviation Administration, Pilot Handbook (Chapter 14: Airspace), 2014. Federal Aviation Administration, Programs and Initiatives – “Unmanned Aircraft Systems (UAS),” 2014. CBS News. “Amazon unveils futuristic plan: Delivery by drone.” Dec.
Griffiths, Sarah. “Now DHL tests a delivery drone: Airborne robots could be used to deliver medicine to hard-‐to-‐reach places.” The Daily Mail. December 2013. Davidson, Helen. “Drone book delivery service aims for take off in November.” The Guardian. October 15. Michalek, J. J.; Chester, M.; Jaramillo, P.; Samaras, C.; Shiau, C. S. N. & Lave, L. B. Valuation of plug‐in vehicle life cycle air emissions and oil displacement benefits. Proceedings of the National Academy of Sciences, 2011, 108.